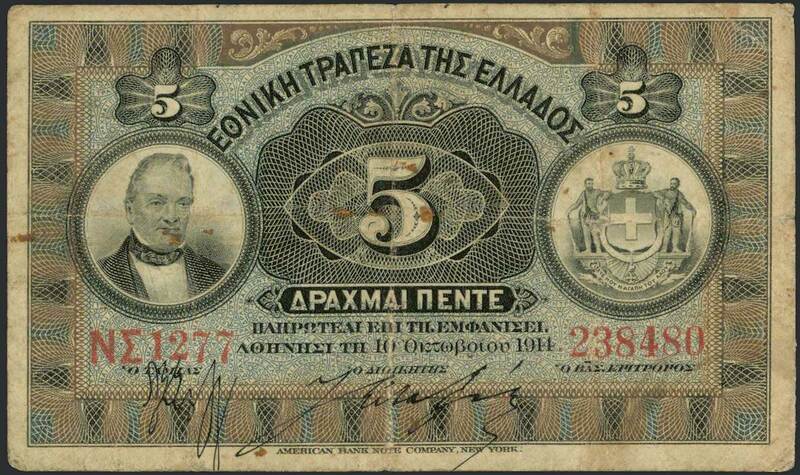 5 Drachmas (10.10.1914) in black on purple and green unpt with "Portrait of G. Stavros" at left and "Arms of King George I" at right. Printed by ABNC. Governors signature by Eftaxias. (Pick 54a). Very Good. Lot 355 - Argentina general issues - Guillermo Jalil - Philatino Auction # 1916 ARGENTINA: "Budget" auction with many good lots at VERY LOW STARTS! Lot 387 - Argentina general issues - Guillermo Jalil - Philatino Auction # 1916 ARGENTINA: "Budget" auction with many good lots at VERY LOW STARTS!